I Never thought I’d hear these words… But it happened, and it sent a happy buzz through my core. 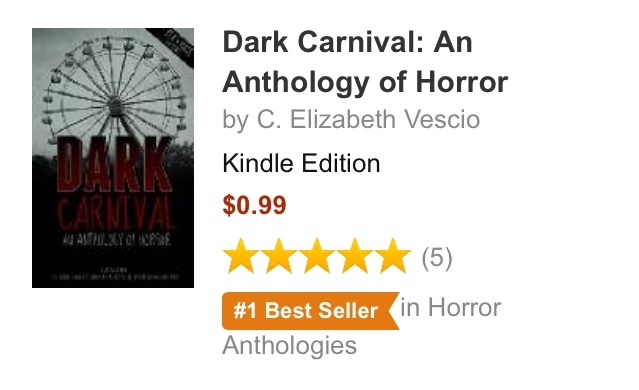 DARK CARNIVAL: An Anthology of Horror hit NUMBER ONE Best Seller on Amazon Horror Anthologies. It is not everyday you hear these words, and I’m totally grateful to everyone who has read the short stories. If you haven’t had the pleasure, then what are you waiting for? Check out at Amazon. Again, I thank the Muses at Pen and Muse Press for coming up with the concept and publishing my work ‘The Pendour Cove Siren’ as part of the compilation. This entry was posted in Home and tagged Amazon, Best Seller, Dark Carnival, Freak Show, Horror Anthology, Mermaid, Pen and Muse, Pendour Cove Siren, Ruth Shedwick. Bookmark the permalink.